As of now, it looks like Japan is going to actively get in on this recent rush to go nuclear everywhere. According to this article, they'll be setting up a deal funded by their government to export the technology. It's kind of like the old AEC Power Demonstration Reactor Program in that there's both federal and private funding, but the important point is that it's being exported. (We kind of tried that with BONUS-1 in Puerto Rico, didn't we?) It sure looks like THEY have their stuff in one sock, and are ready to get to work. What are we doing except sitting on our hands? I saw this yesterday, and made a mental note to go back and link it. This article explains in a nutshell what the $13 million would be for- that's on top of the $8.3 million guarantees made in February that I thought might well signal the first stirrings of the renewal of nuclear energy in the private sector here in the US. Given his prior history relative to TMI-2, one wonders whether Robert Leppzer is trying to "show all sides" at Vermont Yankee or whether he's trying to torpedo the nuclear power industry. Looking here, we see that Entergy is going to allow Leppzer to accompany an inspection team at Vermont Yankee and probably take a camera. Now, we all know that this plant has had some bad PR relative to tritium in groundwater, but you have to imagine Leppzer smells something and thinks he's going to score with it. Perhaps Leppzer really does want to show all sides - we'll have to wait and see what the slant of his documentary is. If the final product appears on PBS we'll probably know the outcome before watching, given PBS's slightly left, very enviro- bias. "I believe, at their core, that Entergy is likely incapable of transparency," said Rep. Sarah Edwards, a Brattleboro Progressive. "It is not part of their business model or culture. " Really!? Is that part of Entergy's mission statement? Come on, now. There's no need for such hyperbole, Ms. Edwards. New today in the Wall Street Journal is the story that Entergy won't spin off five nuclear power plants as it had hoped. This article notes that Entergy's aggregate Mw output is second among operators of nuclear powerplants here in the US. Good news today- this article explains that Iowa intends to have a new nuclear plant under construction in 2014. Just today we find, by reading this article, that the upper Midwest may be on the list to have new nuclear plants built. 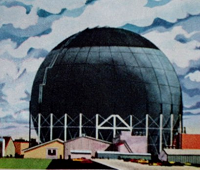 Anyone recall the early bids to give the Midwest atomic energy? 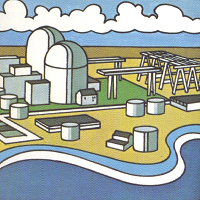 There was the ACF Nuclear Division plant at Elk River, and Allis-Chalmers built the Pathfinder and La Crosse plants. While Elk River had to shut down due to primary leaks and Pathfinder... well, let's just say Pathfinder didn't work at all, La Crosse (aka Dairyland Power Co-Op Genoa No. 2) was a success. Let's hope that every time I post a story about a siting or licensing bill that corresponds with a Presidential photo op that the nuclear part of the deal isn't left in the dust. Way back in 1948, the United States Navy launched three projects to get atomic energy to work on board submarines. 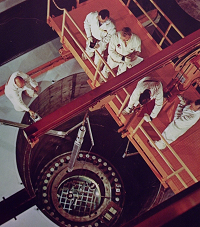 Project Wizard, which was awarded to Westinghouse and which later became STR / S1W and S2W on board the USS Nautilus; Project Genie, awarded to GE which became SIR / S1G and S2G on board USS Seawolf; and a third project for gas turbine work that Allis-Chalmers got but that one was soon dropped. 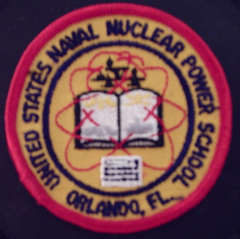 My point is that from that time on we were committed to the fact that submarines needed atomic power. Nautilus proved its superiority in service, and we've never looked back. UNTIL NOW. Look at this article. According to that, we're not only going to have to go back to diesel submarines but we're going to have to run 'em on vegetable oil. Maybe the plan to take the SS-224, the USS Cod, back out in the water in Lake Erie is not nostalgic but prophetic. Our "friends" across the water aren't taking this lying down. Look here and see what they're up to. Be sure to notice the "sophisticated submarine fleet" part of that article. That includes both SSN, or attack subs and SSBN or ballistic missile subs. Yes, let's go ahead and hand the Chinese total superiority in the Pacific in the name of Gaia, Mother Earth, who we corrupt more every day with our nuclear powered aircraft carriers and submarines. Great. So we'll have new nuclear plants here on shore, but we'll be knuckling to the Chinese on all matters Far East and we'll be ordering pressure vessels and heads from Japan. I don't like that scenario at all. An article worth seeing, if only for its inaccuracy..
Those in the know will find this article either amusing or annoying. Notice how right off the bat we're told that the fires were not just fires, but BLAZES. We're also told that "disaster was averted." Whew! Uh, wait a minute.. how close were we ACTUALLY to a "disaster?" And what exactly is.. oh, never mind. The fire at Brunswick occurred in a heat soak blanket where apparently welds were being annealed. That doesn't sound like a blaze, and it sure doesn't sound disaster-worthy given its location. Look at how Progress Energy responded to two breaker fires at Robinson: "There was no explosion or steam line break (sic)." How many more things would you need to rattle off that didn't happen? Later we're told that fires are the No. 1 leading path to reactor meltdown. SO, then, although disaster was averted at all three plants (Perry too, don't forget) it must have been a real cliffhanger. Or cliffhangerS. And then what do we get? Yeah, a rehash of the Browns Ferry cable tray fire incident. Let's recall that all the fixes for that .. 'situation' .. were made years back. This is just more hysteria by a totally incompetent, uninformed press.. the same press that brought you headlines at TMI-2 like "H-Blast Danger Fades" (that line was repeated in "A Second Nuclear Era" - a book I highly recommend that everyone including the PRESS read.) It sure seems that from the '69-'70 time frame of AEC debate of the environmentalists and the NEPA it's been atomic energy on the defensive, and irresponsible hysterical reporting like this is just keeping that going. 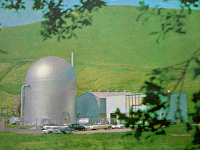 ARE we ready for more nuclear plants, like the administration wants? Yes, certainly-- but the press isn't. Welcome to what might well prove to be the most unlikely blog on the net- one that combines a love of mechanical typewriters and a love of nuclear energy. My name is Will Davis, and I'm well versed in both fields. I'll be using this blog to both relate experiences and impressions from the collecting field related to typewriters, and also (and perhaps far more importantly) relate my views on present and future developments in the field of nuclear energy. Recently, President Obama clearly laid out plans to spur funding for new nuclear plant construction, which has effectively been on hiatus since 1978. Yes, I said 1978- the year the flood of new orders for nuclear plants in the US shut off. This is indeed prior to the accident at TMI-2 (that's Three Mile Island No. 2, for those not in on the lingo) and this means that the TMI-2 incident DIDN'T temporarily kill off the nuclear power growth in the US. (First post and one fallacy already knocked down; many, many more to follow.) This is good news; we've needed this for a long time, and if, for example, we're really expecting hydrogen-powered cars to be a fixture then we'll need nuclear energy to dissociate water to get that hydrogen. Sure, the net energy INPUT will exceed any efficiency advantage that a H2-powered car would show over gas or diesel (anyone figured out how to modify the grid to support the nationwide refrigeration plants needed to keep all that hydrogen at minus 423F to keep it a liquid?) but, hey, that's not where the nation's looking right now. I'll be going into lots of detail on various news items in the immediate future. I'll also provide lighter material for those technologically minded folks that appreciate fine old writing machines (or in some cases, really junky typewriters.) Stay tuned for what I hope will be a long run!